Anyone who knows me knows that I love a good analogy, and my favourite one to speak about with regards to early childhood education is the idea of a classroom as a garden. I love to speak about that idea with my colleagues, and have been wanting to blog about it for a while now to share my thoughts. Like many educators, I posted photos online in early September of our classroom setup. I did this for a variety of reasons - sharing ideas with other teachers, hearing their feedback, and of course, a general sense of pride in our hard work in transforming the space for a new year. 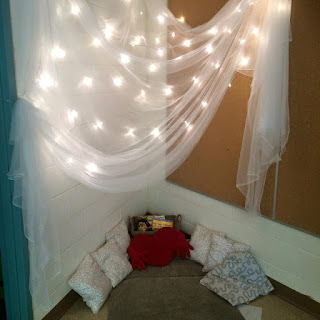 However, I'm a firm believer that the idea of "classroom setup" is not a September singularly concept, but rather an ongoing and transforming idea as the school year progresses. In so many ways, I like to approach classroom setup as I would a garden. But what do I mean by that? Like a garden, classrooms need weeding. My ongoing professional goal over the past few years has been to streamline and de-clutter our learning environment. I've found, like gardening, the weeding process is ongoing (and sometimes never ending! ), but really so worth it. By clearing out the weeds (classroom clutter) it allows the blooms (or the purposeful and meaningful learning) to not only be seen, but appreciated in their full glory. In fact, many plants (or students!) grow better in these sort of spaces - spaces that are pruned and tended to with love and care. Like a garden, classrooms have different seasons, months, weeks. Just like certain seeds to be planted at certain times in a garden, certain ideas or learning provocations may be more successful when they are presented at the right time for your unique students. For me, this speaks volumes to the idea that while there are huge benefits of sharing ideas online, we need to be mindful that we're not simply plunking down ideas in our rooms that seem nice, but rather thinking critically if they work for our students at this time. Perhaps some concepts or learning areas would be more successful if we waited, like gardening, until the "right season" for that growth. Like in a garden, we try to plant seeds and sometimes they take, and sometimes they don't. We're not against letting some go, and revisiting (or trying again with those seeds) when the time/season is right. Like a garden, our classrooms need to be sufficiently supplied with what they need to grow - and this may not be the same for every plant, or centre. Learning Centres should change as your students grow and develop. 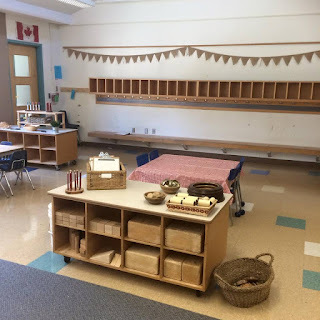 We like to start sparse, allowing students to master the intended learning in our classroom without being overwhelmed, but as our year progresses and students show such remarkable mastery, growth, and development as Kindergartens do, our Learning Centres change with them. By adding additional materials and learning materials at the right time, we contribute to the success we see. But just how some plants need full shade and some need part sun, not all Learning Centres will need the same thing. Some may be more open ended/student directed while others need a specific teacher supplied provocation or prompt. 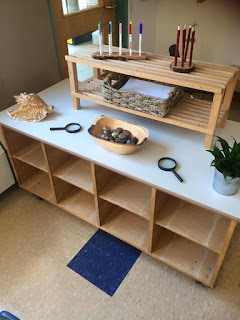 My teaching partner and I always laugh because whenever we're done tending to a specific Learning Centre and giving it what it needs to be used successfully by our students, we turn around and see that other Learning Centres are now in need of the same thought and attention. And thus the gardening process continues! 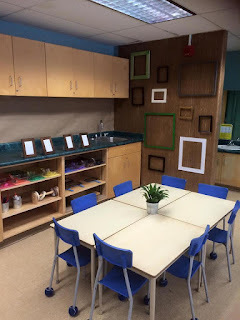 Like I said before, the idea of classroom setup has never been just a start of year thing to me, as I believe it's never ending - just like gardening, it's a year long process. I'm now going to share some photos here of our space in September, knowing that several of my upcoming blog posts are going to detail specifically how the space has evolved and changed the more we get to know the unique students in our community this year - we've weeded and weeded and weeded, and while many seeds have taken and bloomed, some didn't take - and thus we reflected on what we neglected to consider, and several centres have been tended to and even changed so that they can be successful. To me, our classroom is like a garden - not only for the reasons listed above, but also in the sense of being full of beautiful blooming minds demonstrating ongoing growth. Feel free to comment your thoughts on this analogy, and how you've seen it interpreted in your space.